This insightful monograph explodes some of the myths introduced by well-known business consultants and by strategic planning academics and replaces myth with comprehensive model of business strategies that is a applicable to the contemporary marketplace where international trade and competitiveness are issues of critical concern. Today's American businesses are challenged both at home and abroad in market battles that frequently threaten the survival of entire domestic industries. 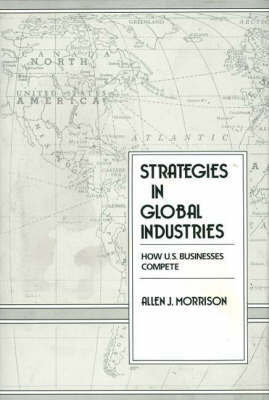 In Strategies in Global Industries, Morrison develops a comprehensive model of business strategies that is a prescription for increasing the competitiveness of U.S. companies. He argues that many U.S. firms misperceive global industry opportunities and, as a consequence, pursue strategies that may suboptimize performance. Indeed, Morrison found little evidence that U.S. businesses are actually competitive on a global scale. Results of his study of 115 global U.S. companies that have annual average sales of over $900 million form the basis for his groundbreaking conclusions that will have wide applicability to global concerns. The study's conceptual foundation consists of an integration of the contingency perspective of strategic management and the industry organization perspective of the business's context. These two perspectives are vital to an in-depth understanding of the relationship between business strategy and performance in global industries. Four appendixes detail the survey instrument and SIC Code-related data. Twenty-six figures graphically display information relating to strategy classification, research methodology, global industries, key business unit characteristics, strategy types and dimensions in global industries, and more. An important contribution to the vital study of U.S. competitiveness on a global scale, the volume offers many, fact-based new insights into ways to foster and improve the competitiveness of U.S. companies.